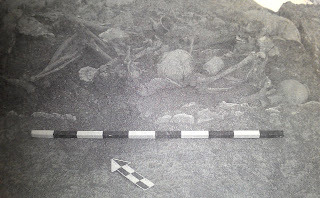 Traditionally, skeletal analysis in search of answers about human lives has fallen into two camps: the study of populations is the purview of bioarchaeologists, who want to know more about life in the past, and the study of individuals is the purview of forensic anthropologists, who want to put a name with the set of bones they have in front of them. This line has started to blur over the last few years in that bioarchaeologists are realizing they can craft stories of individual lives from the vast array of methods and techniques available to the 21st century researcher. Osteobiography has become a hot topic, and many bioarchaeologists are using the data they generate from a skeleton to humanize the past, to sprinkle stories about daily life in with their more science-y charts and graphs. What's key about the technique of osteobiography, though, is that there is substantial evidence behind the story -- these are not simply fanciful reimaginings of an ahistorical past but sketches made from the outlines provided by scientific data drawn from the disciplines of osteology, medicine, and archaeology, among others. This change in bioarchaeology -- from a population-focused discipline to one that recognizes the role of the individual in creating that population (and in being created by that population) -- has been long in coming but is sorely needed. Humanizing the past not only helps us understand where we've been, it lets us share that information with the public in a way far more appealing than scatterplots. To this end, there's even a new book (that, I'll admit, I own but haven't read yet) called The Bioarchaeology of Individuals, a collection of osteobiographical narratives from most of the major players in American bioarchaeology. There are, however, good ways to do osteobiography and bad ways to do it. Let's start with the bad, shall we? Credit: Noelle Soren, from this PDF. Eternally frozen in a protective embrace, the remains of an ancient family vividly testify to the enduring power of love. 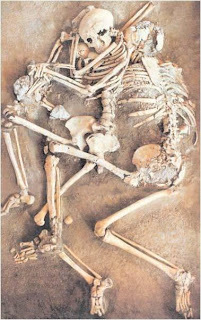 When a powerful earthquake struck Kourion, Cyprus, on July 21, 365 A.D., a 25-year-old man (the skeleton at right in the photo) tried to comfort his 19-year-old wife, who, in turn, attempted to shield their infant child from collapsing walls. In his History, the fourth-century A.D. historian Ammianus Marcellinus described this earthquake as “a frightful disaster surpassing anything related either in legend or authentic history. Deconstructing just this caption is difficult. First, what evidence do we have of social structure from Cyprus? I suspect there's a lot, but none of it is referenced to support the conclusion of a nuclear family. Second, there are no references to the osteological evidence that support the age-at-death of the three individuals in the photo, and the ages seem strangely precise. 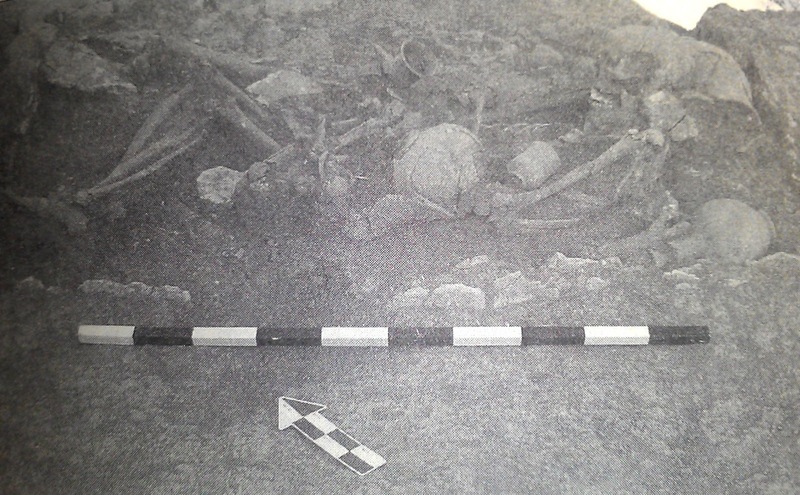 Third, reconstructing a sequence of events from skeletal (or even archaeological) remains is difficult because of taphonomic processes that occur after death of a person (or abandonment of a site). There is no mention of what other than the positioning of the skeletons leads him to the conclusion of a "protective embrace." And fourth... enduring power of love? Yeah, sure. Our most dramatic discovery lay in a makeshift room installed in the entry corridor of the structure. Here we found a 25-year-old man and a 19-year-old woman, presumably husband and wife. To protect his wife from falling debris, the man had placed his leg over her pelvis and his arm over her shoulder. They were holding hands; she had a hairpin in her hair. A large falling chunk of plaster had struck her skull, snapping her neck at right angles and killing her. The husband took the brunt of the falling blocks as he straddled his wife, and his skull was crushed. Lying near them was a small bronze ring, probably worn by the woman, inscribed with the first two letters of Jesus Christ’s name in Greek, chi and rho (for Christos), plus the letters alpha and omega, signifying the beginning and the end—as haunting a coincidence as one might ever find at an archaeological site. I still don't buy the positioning argument. There are so very many things that could have happened to these bodies in the last two millennia that this very specific reconstruction of a sequence of events (and hand holding) is difficult to swallow. Granted, Soren's article is not in a peer-reviewed publication; it is clearly intended in tone and content to be for the public. Still, it doesn't succeed as a work of osteobiography because it is focused on the moment of death rather than the duration of life and because it does not provide any evidence to support the interpretations given. Fig. 5.2 from Boutin 2011. S04-9 and S04-10. Akap-dagan shook his head in disbelief as he watched his wife's body being placed on the plastered floor of the coffin. Just a few days before, he had stood at the threshold of the courtyard and watched as Ummi-ishara sat in front of her loom, appearing to do ten things at once but still managing to weave one of the most beautiful mardatu he had ever seen. With her right hand, she used the shuttle to push weft threads into place; with her left hand, she felt inside a bowl for another nut and cracked its hard shell in her teeth, all the while keeping up a constant patter of gossip and laughter with her sister, who sat next to her spinning thread on a spindle. Akap-dagan felt proud that he would be able to throw such a fine garment over his shoulders at the next meeting of the royal court. He had never regretted paying such a large bride-price for Ummi-ishara--not only was she a weaver of the highest talent, but also she was a happy and agreeable woman. The only dark cloud hanging over them was the conspicuous absence of a baby for her to suckle, even after several years of marriage. S04-9: middle adult male (40 to 50 years old). S04-10: young adult female (18-25 years old). Mardatu was a textile, usually made of wool, but sometimes linen, woven with several colors in a special technique. The deltoid tuberosity of S04-10's right humerus is strongly marked, especially in comparison with the left humerus. The biepicondylar width is also greater on the right side than the left. The humeral articular widths are not significantly different, which suggests that the right side may not have begun to dominate until physiological maturity. S04-10's molar attrition was heavy compared with that of other young adults in the Alalakh skeletal series. Chipping is evident on three anterior teeth, ranging from Grade 1 to Grade 2. A system of bride-price is attested at Alalakh and is characteristic of all Syro-Mesopotamian societies. Bride-price represents a transaction between the groom's family and the bride's family. It is often paid in installments and consists of movable property. S04-10 did not have a preauricular sulcus. As a site of attachment for pelvic joint ligaments, the preauricular sulcus's presence and/or size may be indicative of pregnancy and childbirth, so perhaps S04-10 never bore any children. This is just the opening paragraph of Boutin's biography, but she's already conveyed more about a time and place I know nothing about (Bronze Age Syria) than the entire first chapter of most books would. The chapter is spectacularly well written and showcases exactly what osteobiography should be: the combination of anthropological theory, osteological evidence, and archaeological context. Boutin doesn't have the skeleton photo-op that Soren does, but her narrative is far more intriguing because it shows what daily life was like rather than telling what happened at one point in time. Osteobiography is a great way to showcase the past, and I think we bioarchaeologists should all try our hand at it one way or another (I did in my dissertation, albeit not as well as Boutin does). Just a note of warning, though: there's a fine line between reconstructing a narrative and simply telling stories. A.T. Boutin (2011). Crafting a bioarchaeology of personhood: osteobiographical narratives from Alalakh. In: Breathing New Life into the Evidence of Death: Contemporary Approaches to Bioarchaeology, 109-133. D. Soren (2008). Death at Kourion. In: Island Jewels: Understanding Ancient Cyprus and Crete, 3-15. A. Stodder, & A. Palkovich eds. (2012). Bioarchaeology of Individuals. University Press of Florida. DOI: 10.5744/florida/9780813038070.001.0001. are they not making the same mistake when describing feelings? when Boutin wrote "Akap-dagan felt proud" or "He had never regretted" is it that different from the conjetures of Soren before? of course it sounds way better than "the power love"
but aren't the both of they crossing the line to story telling? Well, yes. Of course we can't know if Akap-dagan felt proud, just like we can't know if the two people in Cyprus felt the power of love (cue Huey Lewis...). But there's a difference between ascribing a fleeting feeling to a person (pride) and extrapolating from positioning to a supposed universal understanding that is actually quite culturally contingent (love). That's one of the reasons that the Cypriot story doesn't work for me - it overreaches, trying to make the burials metonymous with love, whereas the Syrian narrative is constrained within time and space to an individual and what he may have felt. I just noticed on Boutin's website that she has posted an osteobiographical narrative from Alalakh based on her dissertation research. Fascinating! I think is tricky,we want to humanize the past,and make it appealing to the reader. but at the same time we want it to still be as objective as can be... , well I still have a lot to read if I want to understand how to do it right so thanks for the books and the link.